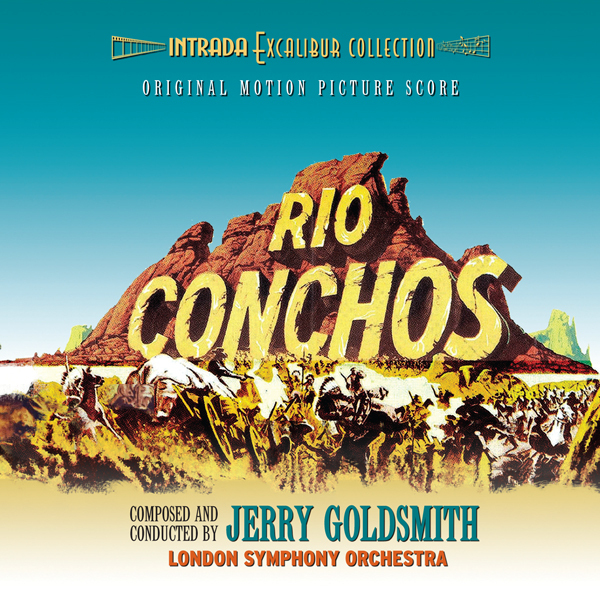 For this re-issue of Intrada's 1989 re-recording of Jerry Goldsmith's Rio Concho, Intrada has refreshed the packaging entirely, remastered from the original '89 masters, and added a few additional features. Now part of Intrada’s Excalibur Collection, this new album premieres the brief but powerful “End Cast” that Goldsmith originally chose to omit, preferring to end the album with the impact of "Special Delivery" at the time. As a bonus, Intrada also includes the first take of the virtuoso action cue “Wall Of Fire.” This initial take features piercing upper trumpets and dynamic trombone accents that Goldsmith toned down considerably for the final album take. Hearing the brass playing fortissimo in this initial effort lends considerable additional intensity to the cue, in marked contrast to the more subdued brass of the 1989 album version. Naturally this release still includes Goldsmith's The Agony and the Ecstasy Prologue, "The Artist Who Did Not Want to Paint." When this digital recording of Rio Conchos was made on August 15 & 16, 1989, it was only the second time Goldsmith had taken an in-depth look at one of his earlier film scores. This exciting trip back in history followed the 1986 re-recording of his favorite work, the 1977 score for Islands in the Stream, also made for the Intrada label and available in the Excalibur Collection as MAF 7095. Marking another debut of sorts, this new recording of 1964’s Rio Conchos also brought Goldsmith face-to-face with the famous London Symphony Orchestra for the first time, a fortuitous encounter that launched the composer’s subsequent series of live concert performances. With Rio Conchos (1964) Goldsmith hit a landmark in his early career, fashioning a challenging score that was difficult to perform, and creating musical devices that would later become Goldsmith “trademarks.” It was with this score that the composer developed his complex action writing. He also wrote virtuoso percussion material featuring, in particular, the snare and bass drum. The scoring called for large orchestra, augmented by guitars, banjos, harp and accordion. The large percussion section included such unusual instruments as bass marimba, crotales, jawbone and lujons. Saddle Up... Ride them Off!